The Norfolk Southern Railway depot in 1966. It was located within the wye tracks of the Norfolk & Western connecting Duke Belt Line at Seaboard Air Line Railroad's Durham Yard. 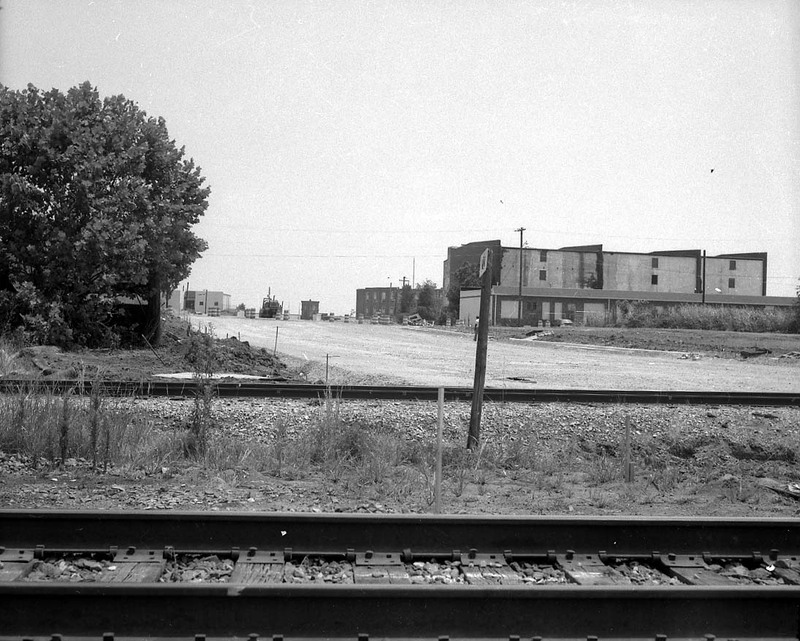 The NS depot is now gone in this 1980 view prior to the construction of Fayetteville St.
Norfolk Southern (NS) reached Durham via a 40 mile branch route off it's Norfolk-Raleigh-Charlotte mainline at Duncan, NC. At South Durham, NS maintained a small yard and facilities known as Keene Yard. 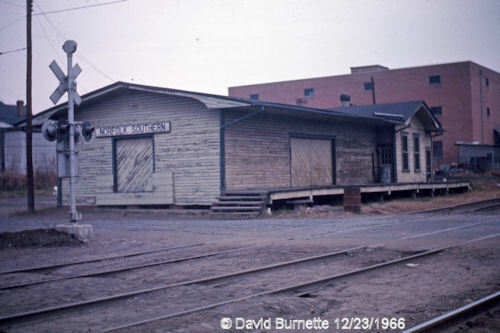 From Keene Yard a spur line ran 3 miles Northwest to American Tobacco Co. NS exclusively served American Tobacco although the cigarette manufacture's plant was located adjacent to the Southern Railway's (SR) and Seaboard Air Line Railroad's (SAL) tracks in downtown Durham. In order to conduct interchange business with Durham's other rail carriers, NS trains would operate over the Durham & Southern Railway's (D&S) mainline through a trackage rights agreement. This was done over another spur running Northeast from Keene Yard to the D&S then over the D&S tracks into Durham. The D&S tracks crossed the Southern Railway tracks and connected with the Seaboard Air Line's Durham-Henderson, NC line which ran parallel to the Southern's through the city. This location is known as D&S Jct and from there NS and D&S trains operated into the SAL Durham Yard. NS maintained a freight depot that was located within the Norfolk & Western Railway's wye near the SAL yard. Ironically, the NS depot was nowhere near the railroad's own tracks or facilities in Durham. Norfolk Southern was bought by Southern Railway in 1974. The depot most likely did not survive too much longer afterward since Southern already had facilites at it's East Durham Yard. The location of where NS depot stood is now Fayetteville Street. Southern abandoned much of the old NS tracks in the mid-1980's and the right-of-way is now the American Tobacco Trail. 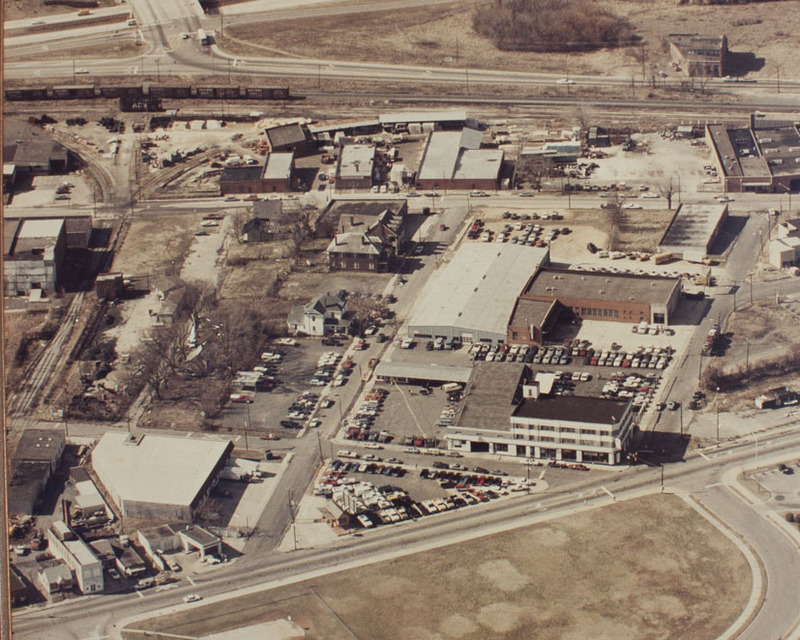 Below, late 1960s/1970 view, with the depot demolished. Fayetteville Street has been carried over the freeway, but does not cross the railroad tracks in this view. Below, the new crossing being created in 1971 for Fayetteville Street.